Saint Lucy’s Day – Lucia – is celebrated on the 13th of December. 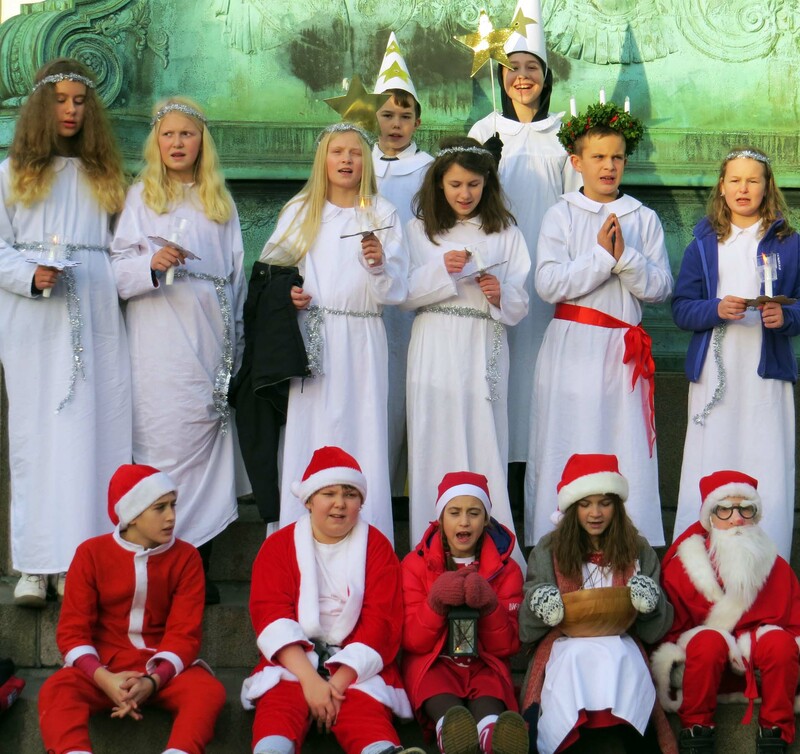 In Sweden it involves a Lucia tåg – a singing procession of Lucy and supporters. On 13th December 2013 I took this picture (and the wider one below) of a school class singing in public. I published it at GBG365 the day after. They were collecting money for a charity, for Musikhjälpen, which was visiting Gothenburg at the time. The group were standing on the steps of the Copper Mare (Kopparmärra). This is the Gothenburg joke name for the copper stallion on which King Carl IX sits at Kingsgate Square (Kungsportsplatsen). Although the sun was bright, it was damn cold. All the kids were wearing winter clothes under their nightgowns and Santa suits. 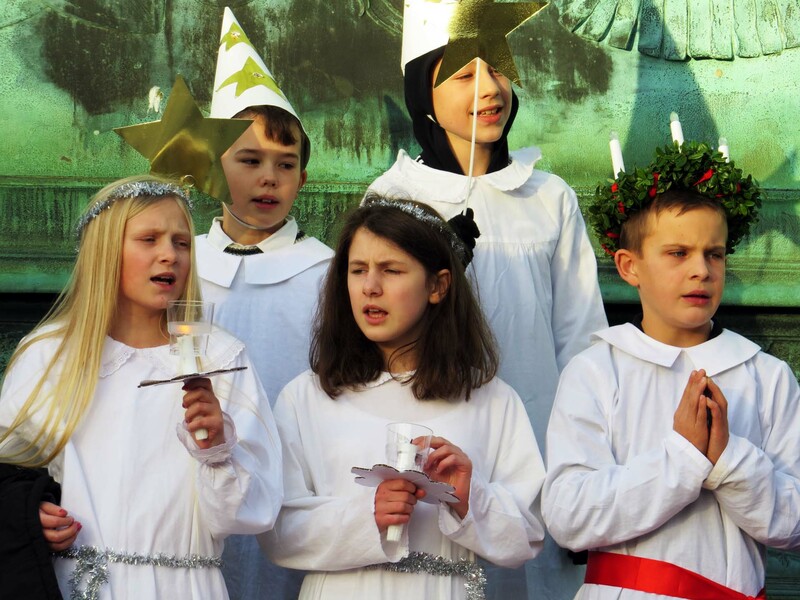 Unusually – though in the spirit of egalitarianism – Lucia (the one with a crown of candles) is personified in this group by a boy. Traditionally Lucia is accompanied by attendants and here is a fine collection. The ones in the white nightgowns with silver glitter belts are tärnor. The ones with gold stars on their cone hats are stjärngossar. And the tomtenissar are the ones in Santa suits. Lucia is an important event in Sweden. Together with Advent, it marks the start of the Christmas festivities. In this northern country where the days are so short, any excuse to light candles and switch on fairy lights is important. It’s a reason to party too, and there are many Lucia-themed parties about this time. I saw a very tired teenage Lucia on the morning tram in 2010.